In today’s Sunday edition of the Las Vegas Review-Journal, Clark County Treasurer Laura B. Fitzpatrick ran a big ad saying that quarterly property taxes were due in a week, on October 2. Folks were advised that they could see what they owed by going to the Treasurer’s web site. Government officials should be prepared for the possibility their efforts will succeed. The Clark County Treasurer is an elected position, next facing the voters in 2018. Meanwhile, still New To Las Vegas, I’ll try again on Monday after the IT staff gets in. 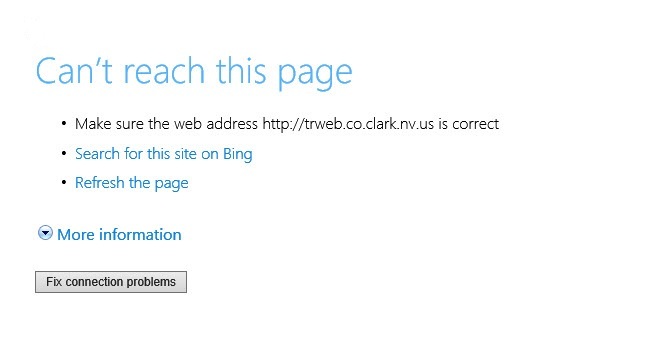 Notwithstanding the language here, I should point out that the Clark County Website is fine. It’s just the property tax bill inquiry page that isn’t working. That’s a hoot!! Good luck on Monday.